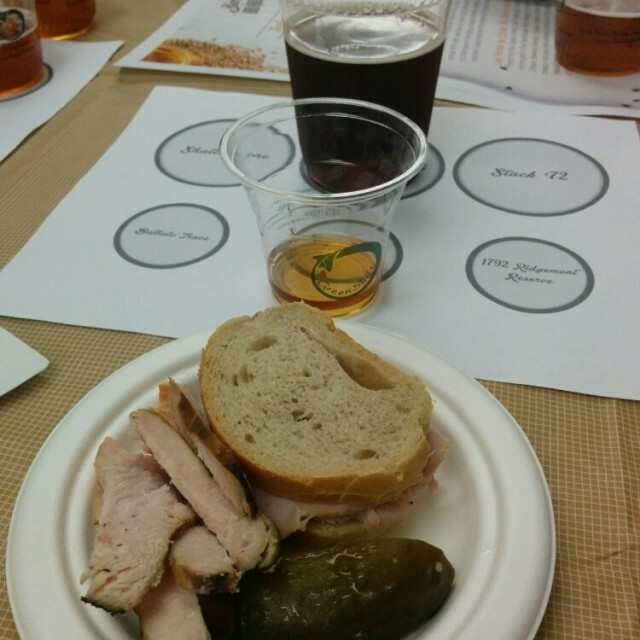 Last week I read a post on Ben Johnson’s Beer Blog about an event he would be hosting involving beer, bourbon, and smoked meat. Join us for our very first beer and bourbon dinner. We’re pairing some of Stack Brewing’s delicious suds with a few tasty bourbons from Buffalo Trace, Eagle Rare and 1792. Top that off with a couple of Caplansky’s mouth-watering sandwiches and you’ve got yourself the world’s first beer, bourbon and sandwich networking event! Hosted by blogTO’s Ben Johnson at Project: OWL, this is guaranteed to be good night with great people and even better beer. So I obviously bought tickets. I like bourbon, I’d never tried Stack Brewing‘s beer, and I like smoked meat. This was a no-brainer. So last night Nellie and I arrived at this address we’d never been to, or even heard of, and find out it’s a networking event. In retrospect it seems obvious that the ticket site’s page title — Beerworking — pointed to some kind of networking event, but we just thought it was some kind of half-clever beer event name. But nope: it’s a beer-themed networking series. Anyway, we’d pre-paid, so we were committed. We bought a pre-dinner beer (Stack’s Saturday Night cream ale) and unwound from our day on the comfy couches. Ignoring everyone else, of course. When it came time to start the event we found a table and ended up sitting with some fun people. We had no interest in actual networking, but we met some cool beer nerds, so it worked out. We also got to try to some beer that very rarely makes its way down to Toronto from Sudbury. Stack’s three beers for the pairing were the Shatter Cone IPA, Les Portes de L’Enfer Bière de Garde, and Stack ’72 Imperial IPA. They were good, excellent, and very good respectively. The bourbons and tiny sandwiches were delivered at the same time, so…it was like three flights of beer + bourbon + smoked meat. Honestly, I’m not sure I detecting any real pairing synergies, but most everything was tasty. Bourbons #1 (Buffalo Trace) and #3 (1792) were really good; I didn’t like #2 (Eagle Rare) that much. Meanwhile, the Caplansky’s sandwich sequence was (I believe) corned beef, smoked turkey, and smoked meat. Actually, I kinda don’t care about the order; they were all terrific. Neither of us really ate much all day, so when we left the beer, bourbon, and smoked meat event we took a cab to the everyday beer, bourbon, and bbq event: Triple A. We ordered pints and split ribs. I’m hungry just thinking about it all.